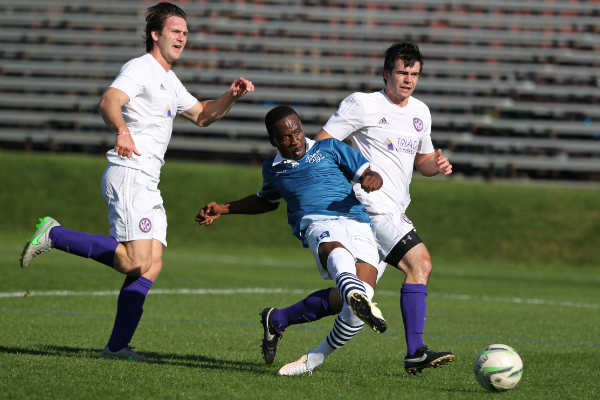 Minneapolis City SC emerged the victor from a closely fought cup tie with Rochester Hills, Mich.’s Oakland County FC, thanks to an extra-time goal from winger Whitney Browne. City frequently had the run of play on the afternoon, but County goal keeper Nathan Steinwascher repeatedly frustrated the Crows, keeping County in the game and forcing 30 additional minutes. Whitney Browne was a deserved Man of the Match, scoring 22nd and 95th minute goals for the Crows. County winger Shawn Sloan — scoring in a second-straight U.S. Open Cup qualifier — opened the scoring in the 17th minute. Over 300 people were in attendance at the National Sports Center on a beautiful fall day. Temperatures stayed in the low 60s with little wind and few clouds in sight. The two teams ran out with starting XIs of similar shape. Player-manager Nicolino Morana set up his County teammates in a 4-2-3-1. Nathan Steinwascher started in goal behind a back four of Mike Pugh, Jamie Foxwell, Ryan Messick and Jacob Prud’homme. Moussa Diallo and Brent Schmid formed the base of a midfield triangle, with Theo Foutris at its point. Dangerman Shawn Sloan started on the right wing opposite Joe Beshara before swapping sides early in the first half. Mikel Alia operated as a lone striker. City technical director and Open Cup head coach Jon Bisswurm countered with a 4-3-3, using a single holding midfielder to County’s pair. Matt Elder played between the posts, guarded by a back four of Brian Chapman, Joey Gustafson, A.J. Albers and Charlie Adams. Miles Stockman-Willis sat in front of defense and behind Martin Browne and Ben Wexler in the center of midfield. Tim Wills spearheaded the Crows’ attack as a center forward, flanked by Abbai Habte and Whitney Browne. Host Minneapolis had a full bench consisting of defenders Evan Wright, Emmanuel Brown and Landy Mattison, midfielders Tom Corcoran and Chase Carey, forward Keido Toure, and goal keeper James Neher. Oakland County had made the 12-hour trip by bus with a spartan 13-man roster, leaving only forward Kevin Pinkos and player-coach Morana in reserve. Oakland County controlled most of the possession in the first five minutes, but was unable to threaten Minneapolis’ goal during that opening stretch. The first scoring chance of the game occurred in the 6th minute. Whitney Browne — making a diagonal run behind his mark — ran on to the end of a through ball, then squared his path parallel to the edge of the 18-yard box. 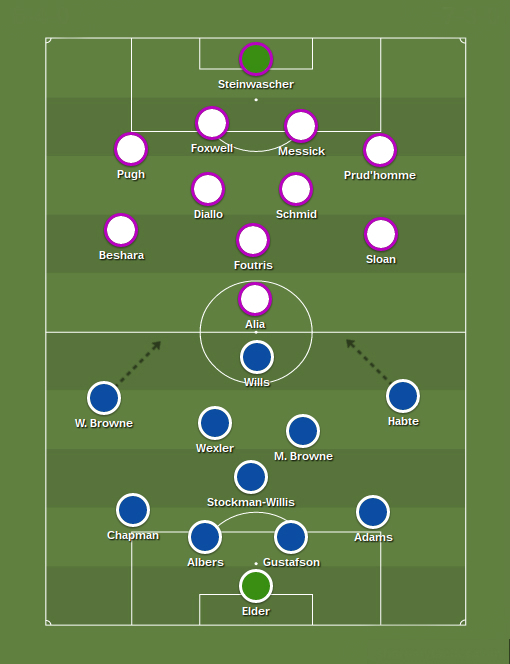 The winger played a square ball towards the center of the penalty area for a streaking Wills, but the forward’s resulting effort went low and wide of Steinwascher’s left post. A minute later, on City’s opposite flank, Habte was nearly played in on goal, but a well-timed sliding challenge from County’s center back Foxwell smothered the opportunity. Neither side was finding much success playing through the middle of the field, with both teams packing the center with three midfielders. City was starting to find space for its wingers on the flanks via long diagonal balls played out from its back line and midfield. When able to work the ball up near County’s 18-yard box, the Crows were able manage a bit of short combination play, but were unable to find the final ball needed to break down County’s back line. Rallying back from being pinned on its heels for near 10 minutes, County found success with a bit of build-up play. Sloan let loose with a well-struck volley from just inside the penalty area in the 15th minute, forcing Elder to parry. The goal keeper was able to get a pair of hands on the ball while at full-dive to his left. Two minutes later, Schmid played the ball between City’s ranks, putting Sloan one-on-one with City’s full back Adams. Checking the ball on to his right foot after a feint, Sloan was able to drive the ball inside the near post and past Elder, putting County up 1-0. City tried to answer back 3 minutes later when a Martin Browne pass carried Wexler into County’s penalty area, but Foxwell and Pugh smothered the creative midfielder and Wexler’s shot was blocked. Martin Browne would again attempt to set one of his City teammates up in the 22nd minute, playing a ball between Pugh and Foxwell for his brother Whitney. The winger was able to hold off a defender on his back, and bearing down one-on-one with Steinwascher, slotted the ball low to the keeper’s left. Steinwascher was able to get part of his hand to the ball, but was unable to redirect it around his post. The ball rolled across the goal line, leveling the score at 1-1. The goal had come from a slightly unexpected source, as the key pass was made from distance along the ground, whereas a majority of City’s prior play had consisted of long diagonal balls sprayed out to the wings, or attempts at short combination play. Browne nearly scored again in the 28th, beating Pugh off the dribble. Driving towards goal with a defender on his shoulder, the winger could only manage to scuff a shot in the direction of Steinwascher, as the goal keeper comfortably collected the ball. 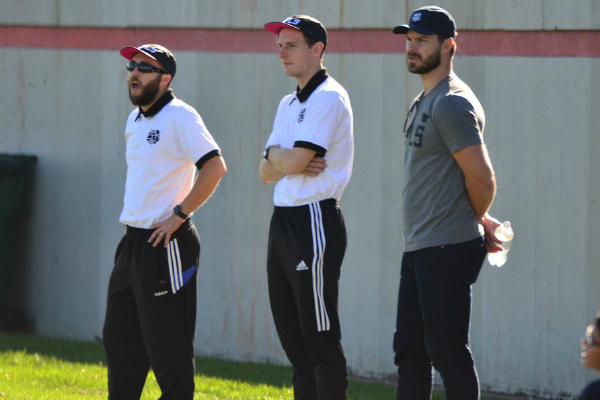 Misfortune struck Oakland County in the 33rd minute. Alia — who had been noticeably limping for several minutes — was deemed unable to carry on, and County was forced to make a substitution, sending Kevin Pinkos on in his stead. Shortly after Pinkos had come on, City came close to scoring again. Wills, making a run directly in on goal, was picked up by Whitney Browne who was in possession along City’s right flank. The cross found the outstretched foot of Wills, but the forward only managed to softly settle the ball for Steinwascher to gather. The two sides would attempt to catch each other off guard via the long ball, but no real scoring chances materialized for the remainder of the half. Neither team made any changes to its lineup coming out of halftime, and the second half began in similar fashion to how the first had ended. 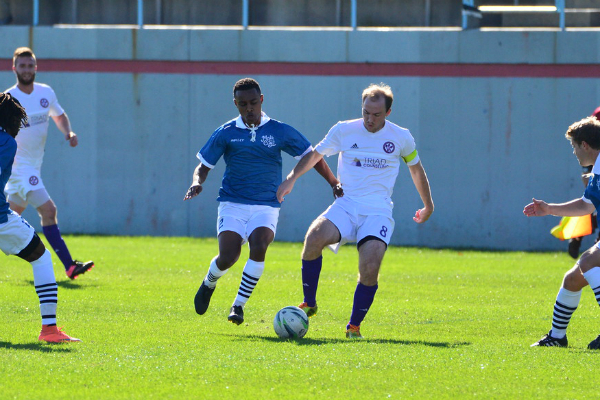 In the 48th minute, Habte used his pace to drive the ball into County’s penalty area. Drawing a pair of defenders, the winger cut the ball back for Wills. The forward seemed not to make the cleanest of contact with the ball, and the resulting effort was rolled directly at Steinwascher. Though the forward’s finishing was wanting, Wills’ workrate and movement presented a consistent threat. Moments later, on the other end of the field, Pinkos was able to split City’s center backs in a footrace for a ball played over the top, as County played long from its back line. Only a clean and precisely timed diving tackle from Gustafson prevented Pinkos from going through on goal, as City’s center back was able to poke the ball away while stretching around Pinkos from behind. While City enjoyed most of the possession following the resumption of play, scoring chances were split evenly between the two teams over the first 10 minutes of the second half. In the 57th minute, a County turnover in midfield sent Whitney Browne through a channel towards goal. Wills accompanied in support, but a pair of County defenders were able to recover in time and secure the middle of the field, isolating Wills from Browne. As had already happened multiple times in the game, Foxwell arrived to make a crucial tackle in his own penalty area, averting danger. Inserting fresh legs into its midfield, City would make its first substitution in the 65th minute. Corcoran came on as a like-for-like replacement for Wexler. Whether it was a lack of substitutes, having to travel from several states away by road, or superior conditioning on City’s part, County began losing the battle for midfield as the second half drew on. But still, Minneapolis was unable to find a goal. Chances for County became fewer and far between, but the white and purple were still able to threaten goal when picking their spots. Diallo sent a dangerous cross in the direction of Sloan around the 70th minute, prompting a jumping, scissor-kick clearance from Adams from inside City’s penalty area. The Crows won a free kick on the other end of the field a few moments later. Corcoran sent a curling ball towards Steinwascher’s far post from 30 yards out, and the goal keeper was momentarily frozen by runs from Stockman-Willis and Albers. Determining late that neither City player would be able to get a head on the ball, the keeper dove to his left and scooped Corcoran’s free kick off the goal line, deftly playing the short hop with one hand. After the subsequent corner was cleared, Bashara was able to dribble around Whitney Browne, but lacked the pace to shake the winger in traffic. 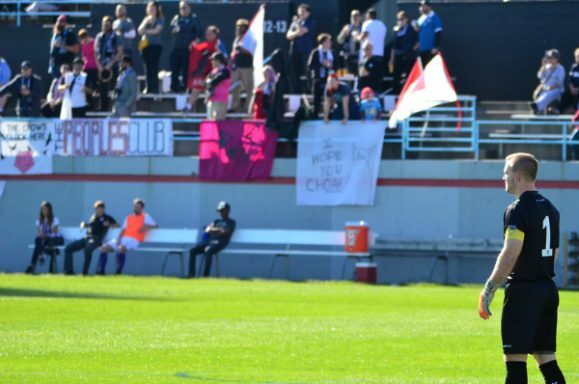 Falling to the ground and grabbing the back of his leg, the winger drew considerable ire from City’s nearby supporters group, the Citizens, as the officials took no notice. In the 77th minute, City conceded a free kick on the outside edge of its own 18-yard box. Sloan sent a curling effort in, but it was headed away by a leaping Stockman-Willis. Schmid was shown yellow in the 81st for a rough tackle, and City nearly took the lead from the resulting free kick. Wills put the ball on the head of Adams, who flicked the ball on for Albers. 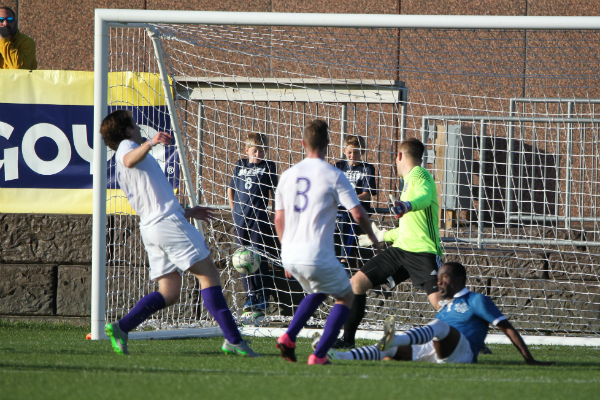 Fully committing, Albers bundled the ball into the goal from short range as Steinwascher was shaken up on the play. Unfortunately for City, the assistant had flagged for offside, ruling Albers had already moved past the last defender prior to Adams’ header. Whitney Browne, taking matters into his own hands, nearly scored in the 87th minute. Going past a pair of County defenders on the dribble the winger was able to round Steinwascher inside the 6-yard box, but the keeper’s effort to close down had pushed Browne wide. Browne’s resulting narrow-angle shot struck the near post, caroming out towards the penalty spot where it was cleared by Oakland County. Chapman looked worse for the wear in the 90th minute, and was replaced at left back by Mattison. Two minutes later, Habte caught County’s back line sleeping. Making a diagonal run to keep onside, Habte darted into yards of space behind County’s defense, receiving a ball played straight up the center of the field. One-on-one with Steinwascher, who had come off his line to cut down Habte’s shooting angle, the winger shot low and to the goal keeper’s left. Steinwascher did notably well to get down and parry the shot with his left hand, preserving the tie. Where most of the second half belonged to City, it was County that made the most of added time. After a scuffle in traffic just outside the top of the D, Purd’homme emerged with the ball and an open look at City’s goal from 22 yards out. The full back let loose with a powerful shot, but sent the ball over Elder’s crossbar. Then, just before regulation came to a close, Sloan received a pass just outside City’s penalty area. The winger was dispossessed by Albers, but again the ball fell to Prud’homme. This time, the full back made sure to put his shot on target, and only Elder diving and parrying to his right was able to keep County from stealing the game late. Habte again found himself one-on-one with Steinwascher after making a diagonal run and receiving the ball behind County’s back line, this time in the 94th minute. Again coming off his line, Steinwascher was able to pressure Habte’s shot, and the winger fired wide of the near post. A minute later, City would finally grab its second goal. Wills flicked a header in the direction of Whitney Browne and Pugh, and both challenged for the header. Pugh lost his footing following the contact while Browne collected the ball and raced in on goal. The winger was able to cut around Foxwell, giving himself enough space to shoot with his right foot. Steinwascher, hung out to dry, was unable to produce another highlight real save, as Browne put the ball into the back of the net to the keeper’s right. The two teams traded half-chances before Wills nearly set up a second goal in extra time in the 101st minute. The forward slipped a clever ball through for Stockman-Willis, but the midfielder shot wide of a diving Steinwascher. Shortly thereafter, Bisswurm opted to replace Wills with Carey with an eye towards killing the last 15 minutes. Morana inserted himself into the game on the wing in the 116th, representing County’s last available substitute. The player-coach was able to get on the end of a cross from Sloan, and attempted to knock the ball down for one of his teammates, but the ball fell into an empty part of City’s penalty area and was cleared shortly thereafter. Content to defend deep while protecting a lead, City conceded much of the possession an imitative to County in the game’s final minutes. Foxwell, pushing forward in search of an equalizer, had his shot from the corner of the 18-yard box parried by Elder in the 108th minute. Carey was shown yellow in the 113th for a late, rough challenge while closing down one of County’s defenders as the visitors sought to keep the ball in City’s half. Foxwell, still keeping an advanced position, got on the end of a cross from Diallo, but the center back’s header went wide of Elder’s goal. Making its only notable charge of the game’s final 15 minutes, City nearly put the contest beyond reach in the 117th when Martin Browne again put his brother Whitney in on goal, but the winger was unable to record a hat trick, shooting low and wide right of Steinwascher. Steinwascher found himself at the other end of the field in the game’s dying moments. Sloan sent a ball into the penalty area in the 120th minute, finding the goal keeper’s head, but Steinwascher was unable to place the effort on target. Seconds later, the final whistle was blown, sending City through to the third qualifying round.